Valentine’s Day approaches and love is in the air! While you were out shopping for roses and heart-shaped boxes of chocolate, Defiance hellbugs have infested Trove’s shattered realms! 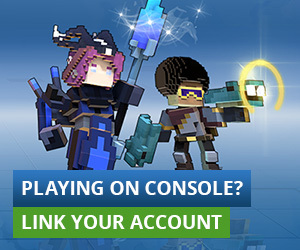 Take part in this special crossover event to earn rewards in both Trove and Defiance. Defiance is a third-person, futuristic, online open-world shooter where thousands of players scour a transformed Earth competing for alien technology. Defiance is Free to Play on Windows, Xbox 360 or PS3! During this event you’ll be able to unlock two gorgeous hellbug mounts for Trove and the brand new Ground Pounder3 in Defiance! Defeat hellbug invaders in Trove to collect Skittering Heart Boxes for a chance to unlock the Pink Hellbug mount! If you play Defiance on console click here for instructions on linking your console to your Glyph account to unlock these rewards. Explore a partially terraformed future earth while collecting an arsenal of amazing weapons in Defiance then dive back into Trove where you can reshape the world and the only limit is your imagination! Discuss this blog on our forums.